USA – A “bomb cyclone” blizzard swept out of the Rockies into the Great Plains on Wednesday, leading the Colorado governor to activate the National Guard and prompting fears of more flooding in areas still recovering from a deluge last month. Warm spring temperatures on Tuesday gave way to heavy snow, gale-force winds and life-threatening conditions on Wednesday across a swath of the central United States running from Colorado to Minnesota, the National Weather Service said. 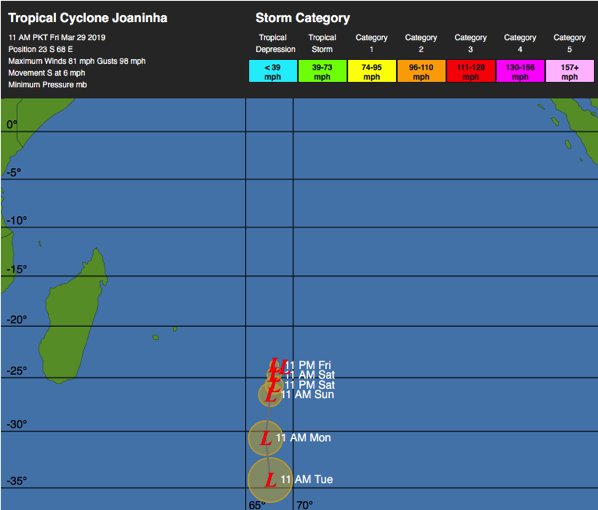 In the Southern Hemisphere: Tropical cyclone 22s (Joaninha), located approximately 622 nm east-southeast of Port Louis, Mauritius, is tracking southward at 06 knots. USA – Severe flooding in the Midwest is damaging fields, disrupting shipments and dealing a costly blow to growers and agribusinesses as a downturn in the farm economy stretches into a sixth year. Swollen rivers in Nebraska, Iowa and other states after months of heavy snow and rain have swamped grain bins and washed away cattle. The deluge has impeded crop shipments for U.S. grain traders and inundated roads and rail lines that companies including Hormel Foods Corp. and Tyson Foods Inc. use to move meat. Meanwhile the White River in South Dakota is in flood and has broken its banks. In the Western Pacific Ocean: Tropical depression (td) 03w (Three), located approximately 121 nm south-southeast of Yap, is tracking westward at 12 knots. In the Southern Hemisphere: Tropical cyclone (tc) 18s (Idai), has dissipated after making landfall in Mozambique, but is still expected to bring substantial rainfall across the area. 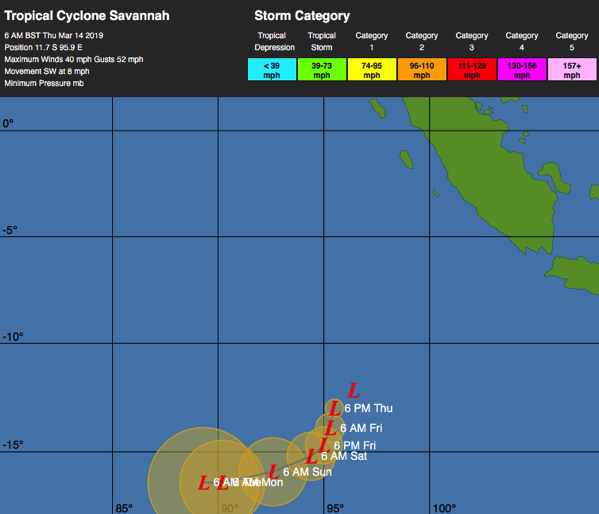 Tropical cyclone 19s (Savannah), located approximately 269 nm southwest of Cocos Island, Australia, is tracking west-southwestward at 05 knots. 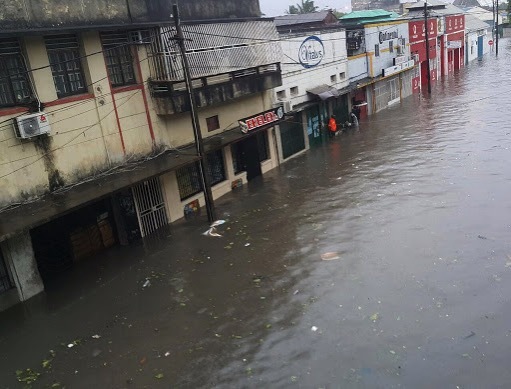 Mozambique – Update – Cyclone Idai dumped more water and brought destruction on areas where scores of people have already been killed and tens of thousands displaced by floods over the past week. Idai made landfall in Mozambique on Thursday evening, battering Beira, a city of around 500,000 people and a gateway for imports to landlocked countries in southeast Africa. Zimbabwe – At least 100 people are missing in parts of eastern Zimbabwe hit by the peripheral effects of tropical cyclone Idai which has lashed Mozambique. 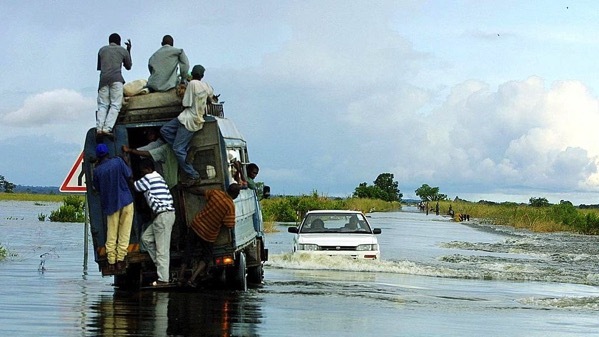 Thousands of people have been affected, power cut off and major bridges flooded in parts of the Manicaland province which borders Mozambique. USA – A harsh late winter storm broadsided a vast swathe of the U.S. agriculture industry this week as heavy snow closed roads and buried cattle in the Plains while excessive rain flooded Midwest farm fields and swamped grain elevators. A “bomb cyclone” hurled hurricane-force winds, sparked tornadoes and dumped heavy snow and rain across the Plains and western Midwest on its march across the United States this week. Recovery from the storm is expected to take days or weeks, if not longer. Prolonged supply disruptions could rattle cattle, hog and feed grain markets around the region and futures on the Chicago Board of Trade and Chicago Mercantile Exchange. The Nebraska Public Power District declared an “unusual event” at its Cooper Nuclear Station power plant on Friday due to the possibility of flooding along the Missouri. Workers filled sandbags along the river levee and procured other materials for flood protection, the agency said. It said the plant continued to operate safely and there was no immediate threat to plant employees or to the public. In the Western Pacific Ocean: Tropical depression (td) 03w (Three), located approximately 295 nm east-southeast of Yap, is tracking westward at 14 knots. In the Southern Hemisphere: Tropical cyclone (tc) 18s (Idai), located approximately 340 nm west-northwest of Europa Island, is tracking westward at 07 knots. Tropical cyclone 19s (Savannah), located approximately 1375 nm east-southeast of Diego Garcia, is tracking southwestward at 04 knots. Mozambique – Update – Category 3 cyclone Idai has made landfall in Mozambique on Thursday evening, bringing with it high wind speeds of up to 224km/h and rain. There are reports of damage and power cuts as the tropical cyclone made landfall. The storm is expected to deliver a massive punch to the country when it hits, as pre-storm flooding in Mozambique has already killed 66 people. The cyclone is gathering strength over the Indian Ocean and is predicted to hit the country in the city of Beira in Sofala Province. Malawi – The number of people killed in floods in southern Malawi has risen to 56, an official said on Wednesday, with the country now also on alert for an approaching tropical cyclone. Almost 83,000 people have been displaced since storms that began more than a week ago caused rivers to break their banks, leaving villages underwater, and knocked out power and water supplies in some areas. USA – Numerous towns in Nebraska and western Iowa were inundated by rising floodwaters Thursday, and the flooding was blamed for at least one death. Residents across the region are being evacuated as levees break or rivers overflow their banks. Roads were closed across the state as they became impassable, and people displaced by the waters took shelter in hospitals, schools and other community buildings. Levels on the Missouri River will surge even higher in the next few days as the U.S. Army Corps of Engineers tries to ease pressure from flooding by ramping up releases from Gavins Point Dam. In the Southern Hemisphere: Tropical cyclone (tc) 18s (Idai), located approximately 221 nm north-northwest of Europa Island, is tracking westward at 07 knots. Tropical cyclone 19s (Savannah), located approximately 1412 nm east-southeast of Diego Garcia, is tracking southwestward at 08 knots. Mozambique – Update – At least 66 people have been killed and 141,000 affected after heavy rains deluged central and northern Mozambique. The government has decreed a red alert. USA – A window-rattling late winter storm brought blizzards, floods and a tornado across more than 25 states Wednesday, stretching from the northern Rocky Mountains to Texas and beyond. Hundreds of drivers were stranded on Colorado highways, including 500 in the Colorado Springs area alone. Scores of motorists took refuge at truck stops in eastern Wyoming while blowing snow forced portions of major highways to close in Colorado, Nebraska and South Dakota. Iowa, USA – An Iowa city has been evacuated and an interstate shut down as rain and melting snow flood the western portion of the state. Harrison County Emergency Management has ordered a partial evacuation of Missouri Valley. People south of Highway 30 and east of Interstate 29 — about 10 percent of the city — have been told to leave. Parts of Missouri Valley, which is about 22 miles north of Council Bluffs and has about 2,600 people, are already underwater. Climate change in the American West may be crossing an ominous threshold, making parts of the region inhospitable for some native pine and fir forests to regrow after wildfires, new research suggests. As temperatures rise, the hotter, drier air and drier soil conditions are increasingly unsuitable for young Douglas firs and ponderosa pines to take root and thrive in some of the region’s low-elevation forests, scientists write in a study published Monday in the Proceedings of the National Academy of Sciences. Wildfires in these areas could lead to abrupt ecosystem changes, from forest to non-forest, that would otherwise take decades to centuries. The two iconic species are important to both the region’s forest ecology and its economy, particularly its timber industry. In the Western Pacific Ocean: Typhoon 02w (Wutip), located approximately 320 nm west-northwest of Navsta, Guam, is tracking north-northwestward at 05 knots. In the Southern Hemisphere: Tropical cyclone 16p (tc) (Pola), located approximately 259 nm east-southeastt of Suva, Fiji, is tracking south-southwestward at 07 knots. USA – The Tennessee Emergency Management Agency reports 14 counties in the state have declared local states of emergency after floods over the weekend. In california the Russian River will crest at 45.9 feet by 10 p.m. Wednesday night. That would be the highest crest since 1997 and the 6th highest crest on record. In the Western Pacific Ocean: Super Typhoon 02w (Wutip), located approximately 304 nm west-northwest of Andersen AFB, Guam, is tracking northward at 03 knots. In the Southern Hemisphere: Tropical cyclone 16p (tc) (Sixteen), located approximately 235 nm southwest of Avata, Samoa, is tracking southward at 10 knots. USA – Residents are using boats to reach flooded-out neighborhoods and schools are shut down after days of torrential rains in north Alabama. The National Weather Service says many areas got around 10 inches (25 centimeters) of rain last week, and some spots received more than 12 inches (30 centimeters). The city of Decatur says water levels already have exceeded 100-year levels and could rise another 2 feet (0.6 meters). Schools are closed in at least a half-dozen systems in the region. In the Western Pacific Ocean: Typhoon 02w (Wutip), located approximately 172 nm west of Navsta, Guam, is tracking west-northwestward at 04 knots. USA – A tornado smashed into a commercial district in the small Mississippi city of Columbus on Saturday afternoon, shattering businesses as severe storms raked the South amid days of drenching rains and a rising flood threat. Elsewhere around the South, homes, highways, parks and bridges have been flooded or put out of commission amid the heavy rains and severe storms. News outlets report that water rescues have been performed in some Middle Tennessee counties. Flash flood warnings and watches remained in place throughout the South and one Mississippi community reported large hail. Interstate 40 near the Tennessee line with North Carolina was closed by a rockslide, one of the dozens of roads and highways shut down throughout the South region, transportation officials said. In the Southern Hemisphere: Tropical cyclone (tc) 15p (Oma), located approximately 357 nm west-northwest of Kingston Island, is tracking southeastward at 09 knots. In the Western Pacific Ocean: Typhoon 02w (Wutip), located approximately 170 nm southwest of Andersen AFB, Guam, is tracking northwestward at 09 knots. Guam – The island had already started feeling the impacts of Typhoon Wutip this morning. Typhoon Wutip is pouring rain on the island. The National Weather Service has issued a flash flood warning. USA – Rounds of rare weather, including floods, snowfall and the risk of a tornado outbreak. have been paralyzing communities across the U.S. this week. The rare phenomenon known as “thundersnow” occurred in both Ohio and Maryland. For the first time in more than a decade, measurable snow fell in Las Vegas, where a half-inch dusted the ground. Flagstaff, AZ, has seen more than 14 inches of snow. The same winter storm that brought the heavy snow triggered an emergency in Prescott, AZ. Torrential rains, up to 6 inches in some places, triggered floods and mudslides in the South. Flooding broke the banks of many rivers that were already at or above flood stage, turning many roads into rivers, and completely destroying some – as the risk of a tornado outbreak threatens a large area of the Southeast this weekend. In the Southern Hemisphere: Tropical cyclone 12s (Funani), located approximately 722 nm east-southeast of Port Louis, Mauritius, is tracking southeastward at 16 knots. Tropical cyclone 13s (Gelena), located approximately 329 nm north-northwest of Port Louis, Mauritius, is tracking southeastward at 09 knots. Tennessee, USA – Massive flash flooding ravaged central Tennessee on Wednesday night. The flooding killed one person and sparked numerous water rescues. According to the National Weather Service (NWS) the flood-related death occurred in Pegram, Tennessee, when a woman was swept away by floodwaters while trying to walk across a bridge. An estimated three to six inches of rain fell in central Tennessee on Wednesday night when a band of heavy rain stalled over the region. Thursday morning saw more settled water, however, some roads are still closed. Queensland, Australia – The Queensland government has announced an inquiry into the historic flooding in Townsville, as evidence mounts that local authorities failed to anticipate the extreme nature of the recent record rainfall. 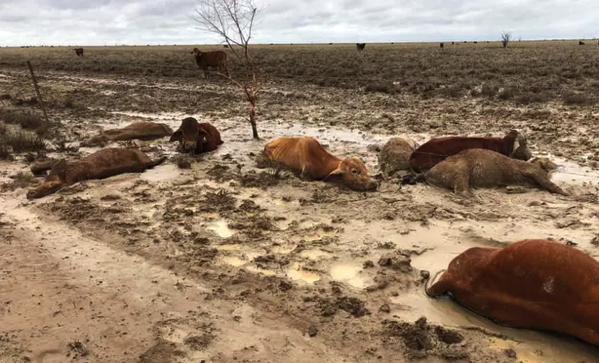 In the west of the state, graziers have been confronted with scenes described by one mayor as “hell”, as it became clear up to 300,000 cattle had died in the floods. Central USA – A potent storm slammed the central United States on Thursday, bringing a ferocious mix of wild weather from blizzard conditions to flash floods. Schools, universities and businesses were closed Thursday in several states as travel proved difficult if not impossible. More than 130,000 customers were without power in Michigan due to the storm. At least five people have been killed. Four died in traffic accidents on snowy or icy roads in the central United States over the past few days and a student died in Seattle after slipping on the ice. Earlier in the week, the storm brought heavy snow and ice to portions of the West Coast, including the Seattle and San Francisco areas. As of midday Thursday, the National Weather Service reported that more than 20 million people were threatened by winter weather, while another 25 million were bracing for flooding. In the Western Pacific: Tropical depression 35w (Thirty-five), located approximately 354 nm south of Manila, Philippines, is tracking west-northwestward at 08 knots. Philippines – Four people were killed in landslides and thousands of others evacuated from their homes after a storm swept through the central Philippine islands on Saturday, officials said. Almost 12,000 people were also evacuated from their homes in the Bicol region after the low-pressure area, locally named “Usman”, hit the eastern side of the country on Saturday. Although Usman’s winds were not too powerful, it still brought heavy rains that caused landslides and flooding in areas it traversed. USA – One snowstorm brought blizzard conditions to portions of the northern Plains and Upper Midwest and a second continues to dump heavy snow from Arizona to the Texas Panhandle. At least three people have died in car crashes due to the central U.S. storm. Meanwhile, drenching rain on the waterlogged southern and eastern United States has prompted flood watches and warnings that are affecting 50 million people. The pounding rain has swept away cars and led to dozens of water rescues. In the Western Pacific: Tropical depression 35w (Thirty-five), located approximately 209 nm southeast of Manila, Philippines, is tracking west-northwestward at 07 knots. USA – Severe weather has flooded homes across Southeast Louisiana. Dozens of homes across Southeast Louisiana took on water overnight due to heavy rain. Heavy rains caused flooding across metro Atlanta. Most of the metro area and north Georgia will remain under a flash flood watch through early Saturday as Atlanta nears record rainfall. Heavy rain Friday felled trees, swelled rivers and flooded roads, closing streets and stranding several drivers who had to be rescued from the rising waters. Flooding from the heavy rain in the Tennessee Valley resulted in a number of road closures. Florida, USA – Rare meteotsunami hits Florida, floods beaches. Scientists say Florida has been it hit by a rare meteotsunami that caused water levels to jump and sent beachgoers running from oncoming waves. Air pressure disturbances and quick-moving storms caused the meteotsunami. The phenomenon shouldn’t be confused with tsunamis, which are caused by earthquakes and other seismic activity. The wave heights, which were projected to be around 1.7 feet (0.5 meters), reached 5 feet (1.5 meters) before decreasing. Wind gusts spiked at 54 mph (87 kph) as a storm brought heavy rains and tornado warnings to the Naples area. The meteotsunami didn’t cause significant flooding inland. In the Western Pacific Ocean: Tropical Storm 14w (Wukong), located approximately 580 nm east of Misawa, Japan, is tracking north-northwestward at 14 knots. Tropical Storm (td) 15w (Jongdari), located approximately 158 nm southwest of Iwo To, Japan, is tracking northeastward at 08 knots. In the Eastern Pacific Ocean: Invest 91E is an area of disturbed weather in the eastern Pacific that has the potential for further tropical development. In the Central Pacific Ocean: Invest 92L is an area of disturbed weather in the central Pacific that has the potential for further tropical development. Invest 93L is an area of disturbed weather in the central Pacific that has the potential for further tropical development. Georgia, Caucasus – On 5 July 2018, due to heavy rain, melting of snow and glacier in the upper part of the river Nenskra basin, a part of the mountain Khokrili (Samegrelo Zemo Svaneti Region, Georgia) collapsed, blocking the Nenskra River bed. As a result, accumulated water flooded the Nenskra valley villages. In total 1,143 people (323 families) live in Chuberi community villages. All of them were affected by the flooding. USA – Millions of Americans on the East Coast were bracing Tuesday for more heavy rain and the risk of flash flooding — some of it “life-threatening” — as states in the West struggled with another day of record-setting heat. At least two people died Monday amid strong downpours pummeling states in the mid-Atlantic and Northeast, which turned low-lying roads into lakes and saturated the ground. Cameroon – Local media in Cameroon are reporting of floods in parts of the country. On Tuesday, the city of Limbe in the country’s South West was hit by floods. While in Douala, the country’s largest city and economic capital located in the Littoral region, heavy rains accompanied by landslides are said to have left scores stranded. Floods continue to cause havoc across parts of Africa where high rain patterns have resulted in loss of lives and destruction to properties. The most recent was in the capital of Ivory Coast, Abidjan where government was forced to evacuate close to 200 families. USA – Helicopters rescued people stranded by flooding in Montana, including 140 children and counselors stuck in a mountain bible camp for two days, as severe storms swept the Rockies and the Midwest. Montana was just drying out from spring flooding caused by near-record snowfall over the winter when a storm unleashed heavy rains last weekend. Flooding in Minnesota and South Dakota caused some road closures. In northwest Iowa, several roads were inundated and basements swamped by heavy rain. Flooding in Virginia forced Richmond International Airport and parts of nearby Interstate 64 to close Friday morning. Meanwhile, great swaths of Arizona, Utah, New Mexico and Colorado were experiencing extreme or exceptional drought, forcing recent closures of national forests and other public lands because of fire danger. Ivory Coast – Update – The cleanup is continuing in Ivory Coast’s southern city of Abidjan after torrential rain caused deadly flash flooding. According to the country’s interior minister, 18 people died on Monday as flash floods raged through parts of the city, reaching a depth of 2.5 metres in some places. Two other people were reported killed in the provinces. On Thursday, the government called for the evacuation of all people living in flood-prone zones. Many parts of the city are vulnerable to flooding, from the up-market Cocody neighbourhood to the densely populated Yopougon area due mainly to lack of infrastructure, including drainage and sewerage.